Charlie’s own mother can’t remember his name. His father is gone for months at a time. Pretty much, he should just be invisible. While on a field trip in Philadelphia, a mysterious clockwork man attempts to kill Charlie. They tumble through a hole that drops them into 18th century London. That’s when things really get interesting. Charlie meets up with Ben Franklin and a girl named Yvaine, who is another time traveler. When they accidentally alter history–allowing Franklin to be killed–Charlie and Yvaine hope to travel through time to fix it. The mysterious clockwork man, however, is determined not to let that happen. 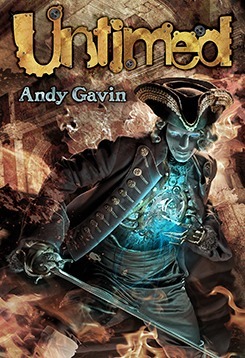 While time travel adventure stories aren’t my normal read, I’m glad I took a chance on Untimed by Andy Gavin. This fast-paced young adult novel is a thrill ride that keeps you on the edge of your seat. Once I started reading, I never wanted to stop. Gavin knows how to create an engaging novel that draws the reader in with rich details and superb storytelling. He ramps up the tension and places obstacles in the way at every turn. Just when Charlie and Yvaine think they have it all figured out, a new problem arises. Well-developed, likable characters fill the pages of this creative novel. The one area I felt disappointed by was the physical nature of Yvaine’s and Charlie’s relationship. Considering that Charlie is in ninth grade and just about to celebrate a birthday at the beginning of the book, that would make him thirteen going on fourteen. While Charlie and Yvaine’s romance is only a small part of the book, I was uncomfortable with some of their actions, especially considering Charlie’s age. When I originally requested this book for review, I thought it might be something that would interest the Lil’ Diva (11). I’m glad I read it first because the sexual nature of the romance in this novel makes it inappropriate for her. Untimed by Andy Gavin is a gripping story with tons of action. Lovers of science-fiction, time travel stories, and adventure will enjoy this one. I received a free paperback copy of this book from the author through Tribute Books Book Tours. This review contains my honest opinions, for which I have not been compensated in any way. Her latest book is the YA steampunk, The Hands of Tarot. Thank you for joining us today, Frankie. Can you please start off by telling us a bit about yourself? Well, right now, I’m in my fuzzy slippers because I decided to wear sandals – sandals, people – to an all-day walk-fest and my feet hurt. I learn everything via the School of Hard Knocks and what I learned today was that sand is a great exfoliator for the bottoms of your feet. The problem is that it doesn’t exfoliate the places you need it. Oh, you mean something deeper? Oh, right, uh, *clears throat* Sorry. Let me put my Big Girl Shoes on. I am full-time writer and a full-time project coordinator for an electrical contractor, a part-time girl-friend, a half-time bird and plant feeder, and a slow-time mom. Sometimes, there’s even cooking involved. I like a wide variety of music, though not quite so much as my very good friend Queen Calisto. Right now, I’m listening to a thunder storm recording. The thing I love to hear the most? Silence. I know. What’s that? I would love to say it was when I was in school, but it wasn’t. I always wrote, but I always drew, and crocheted, and played musical instruments (every woodwind including the bagpipes) and always—It’s safe to say I was always creative. However, I would have to say that it was during those crazy years after MissSunshine was born. I barely remember those days. They’re such a haze. 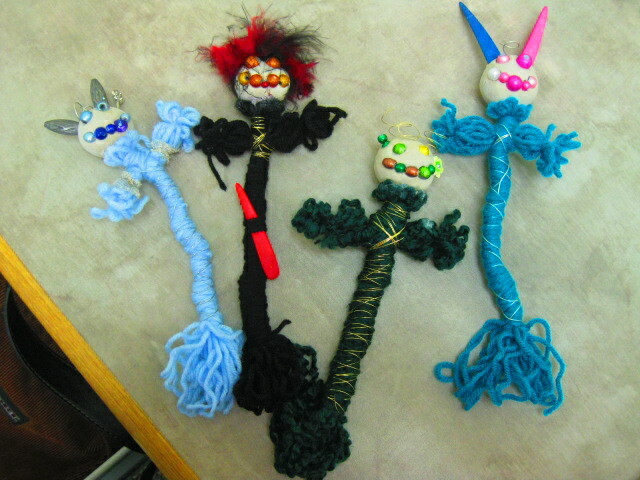 I was working a lot of hours. Had a brand new baby girl who was sick, so I wasn’t sleeping. Oh. Cranky. I was very cranky. That’s about all I remember. Sometime during that, I was telling Miss Think a Dreamland Story (G-version only), and she said, “Mom, you should write a story about Luk.” I think it was just the look of hopeless romance in her big brown eyes. I don’t know. I just knew I had to write. Then several years later, some really awful times hit. I lost my daughters to my parents’ custody, ran out of lawyer money, and basically lost everything. Everything. I had nowhere to go, no one to talk to and all this burning rage to deal with. So I turned to writing for another reason. That’s when it started getting goooooood. Before, it had potential. After I actually experienced real heartache – and it was real heartache – my writing got a LOT better. Why did you decide to write stories for teens? Those awkward years between childhood and adulthood are ROUGH! They can last for a good decade or two…okay, sometimes until a person reaches the age of fifty. It happens. I originally wrote a book for my daughters. It started out as a way for them to see that things could be all right living with me. It turned it, what I really needed was some insight into their lives because, let’s face it, when people divorce (man and wife, daughter and parent) the people who are hurt the most, are the kids. Once I got into that headspace, a whole bunch of things opened up for me, and I realized that I really enjoy writing from the perspective of a person who hasn’t experienced so much that they feel old everyday. As a young adult/new adult, you’re in that sticky situation where every decision you make just gets bigger and bigger, and this is where you first find out what real “consequence” means! I love it. It’s just fantastic! I wince, think deeply and see how to reinact my School of Hard Knock lessons in science-fiction/fantasy. The discovery! There are just so many things that I take for granted. Why? Because I learned how to watch for people who don’t know how to use their blinkers, and I know how to spot the woman driving while doing her make-up and talking on the phone while grabbing something in the back for her kid. (You think I jest.) I’ve reached a certain level of numbness. Spot. Swerve. Avoid. The end. Writing for young people is none of that. It’s experiencing every single second of every single day because you’re learning something new. Sometimes, it’s something you’ve done over and over again, but now there’s no one to help you and you’re learning to be dependable. *eyebrow raising nod* Oh, yes. I love this sense of discovery! Nix thinks she’s captured the ultimate prize, Synn. But is she strong enough to control him? The story is about Synn El’Asim and the Seven Tribal Families. The four queens of the Hands of Tarot have control of the latest technologies, and the most powerful queen, Nix, wants control of the world. The Families are content to allow the Hands to live however they wish in their parts of the world, but as the Hands encroach on parts of the world where only the Families had been able to travel before, they soon realize the time of hiding has passed. It’s not until Synn’s father is killed, and Synn is Marked while trying to save him that the fight becomes personal. Queen Nix sees a powerful tool in Synn and she decides to use him against the Families. The Hands of Tarot is about him, his friends and the Seven Great Families finding the courage to fight back and protect what’s theirs. I’d just killed the main characters for another series. We’d made it through books 1-3 and were half way through 4. I love these characters, and we ended up failing because I didn’t push them hard enough. I was fed up, frustrated, weeping huge alligator tears. Two years worth of writing, gone! But I couldn’t quit. I came up with a game plan for that series and decided to write something else. I needed a break. It was a little like splitting up with a long-time boyfriend, only these kids/characters were my best friends. I needed something totally different to write. So I thought and thought. Different. Hmm. How different? A different planet? Sure. I mean, I had several solar systems growing in my head, and I had this one that was ready for a book. What else? How about a male main character? All my main characters before were female. Mmm! That could be neat! Aahhh-ha-ha! What about the villain? I could have a supremely psychotic, vicious villain! YES! This was going to be an adventure story of fantasmic proportions. *cue hero music* It was going to be epic. There were going to be fantastical discoveries, and Nikola Tesla was going to be the heroic inventor that he always should have been. I was excited! This was going to be the best book EVER! Now, that’s all great, grand and glorious, but it’s nowhere near a plot, a character arc, or a setting. Not only that, but Sactuary was thinking the exact same thing and made Tesla, not only a hero, but a vampire. I just can’t compete with a vampiric genius hero. I had to find something else. I set this to churn-mode, letting it run in the background. I made a solar system out of Styrofoam, hung it from my ceiling and watched it turn for long…well, minutes because I really can’t sit and do nothing for hours. I slowly built this world in my mind. I watched how my little planet coexisted with its solar system, and imagined the seasons. Then, I bought a tarot deck. Why? Because I needed an eighth deck, obviously. I was kicking myself for buying it as I thumbed through the cards, getting familiar with the deck. My brain exploded with ideas! I saw my villain. All of a sudden, there was a plot! I’d been working on this setting for so long, wondering if I was ever going to have a book to go with it, and boom! There it was with the Queen of Wands, The Devil, 3 of Wands, 10 of Swords and the Knight of Cups. Currently, I’m writing The Nightmare which should be out around Christmas. Though at this rate, it could be closer to the New Year. The Nightmare is book two of the Dreamland Stories, which is a great, fun series. OMW (Oh My Word), I’m having such a blast with it! Then next is *squeals* book 2 of The Hands of Tarot, The Knight of Wands. I am SO excited to write this book! It’s screaming at me. There is so much happening in the back of my mind right now. It’s a really hopping place! We’re re-fitting airships, discovering how to make airfleets and our jellyfish cities (letharan cities) coexist, AND (tehehehe) I’m finding new ways to torment my hero. I know, I’m evil! At least I’m writing about it. LOL! I’m always such a blabber. I love hearing from my fans! I especially love getting Tweets from you as you’re reading my book! LOL! Feel free to contact me anytime! I respond almost immediately! I fell in love right then and there. It’s AMAZING! Thank you for spending time with us today, Frankie. We wish you much success. Visit SM Blooding on the web at www.smblooding.com. Stop by SM Blooding’s blog at http://www.smblooding.com/blog/. 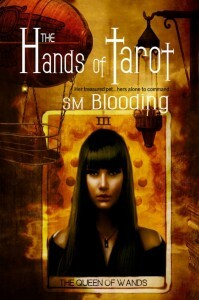 SM Blooding is giving away a set of Tarot Dolls and an autographed copy of The Hands of Tarot! Visit http://www.pumpupyourbook.com/2012/08/05/pump-up-your-book-presents-the-hands-of-tarot-virtual-book-publicity-tour/ for details on how you can enter for your chance to win!